when and where the photo was taken? In this modern era technology is developing day by day and new inventions are coming onto the market.in the earlier time, a few people had cameras to capture pictures and cameras were very heavy to carry by someone with him or her. but nowadays with the advent of technology, mobiles phones of different brands are available in the market which has a large number of functions like one could capture pictures and makes videos at any time and anywhere.these mobile is not only easy to carry but have high dimension picture quality.i have a Samsung mobile and always capture pictures on different occasions. but today I would like to talk about a picture which was taken by my sister in law with my mobile when we had gone to wonderland Jalandhar after my marriage. I had gone to wonderland Jalandhar in the month of June just after my marriage with my in-laws. my sister in law candy is fond of taking pictures and she is very expert in it.we were wondering in the garden. then I saw an artificial fountain where water was falling from an artificial hill made with heavy rocks. It presented a beautiful view of nature. we decided to capture pictures there because it was a beautiful location to take the pictures.everyone was taking pictures one by one turns. then I asked my sister in law candy to capture our picture. she took our picture in a beautiful way.it is really awesome. in the picture, my wife sits on the rock at the center of the fountain and I sit beside her by holding her shoulder.water is falling from the hill behind us.it is really a beautiful picture and it is one of the best pictures in my album.the picture shows our love and our affection with nature. Q-1 do you like to take photographs? Ans: yes definitely I like to take photographs.it is a good source to capture your memories and preserve them for a long time. I like to take photographs since my childhood because my uncle gave me a camera as a gift on my fifth birthday. Q-2 what are the new and easily available sources to capture photographs? Ans: in the past time there were only a few sources to capture pictures.there were only ordinary cameras with a reel in it by through one could have captured only 35 to 36 pictures.but in this modern era,there are not only available higher internal memory cameras by which one could capture a large number of pictures but mobile phones also with an internal memory of 8GB, 16 GB, 32gb and 64 GB. Q-3 what is the new style to take pictures with mobile cameras prevailed in the society nowadays? Ans: the new style to take pictures with mobile cameras is named selfie. mostly youth of the nation is crazy about this new style. some young persons became mad to take selfies that sometimes they have to lose their lives. this style is not only prevailed in my country but all around the world also. Nowadays, people get information through news and papers, but meanwhile are uncertain about the truth of this news. Should we believe the journalists? What qualities should a good journalist or correspondent have? Governments should focus their spending on public services rather than on arts such as Music and Painting. To what extent do you agree or disagree? Describe the time when someone took a good photograph of you. Describe the time when someone took a good photograph of you. Describe the time when someone took a good photograph of you. Describe the time when someone took a good photograph of you. 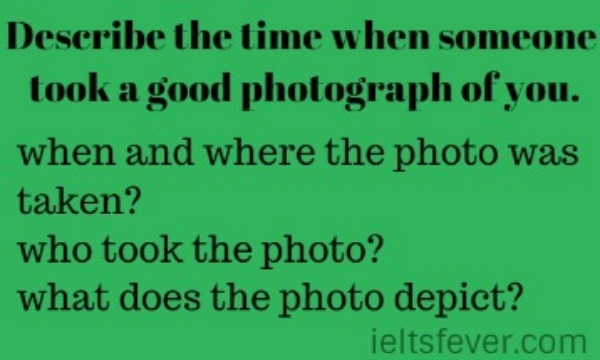 Describe the time when someone took a good photograph of you.